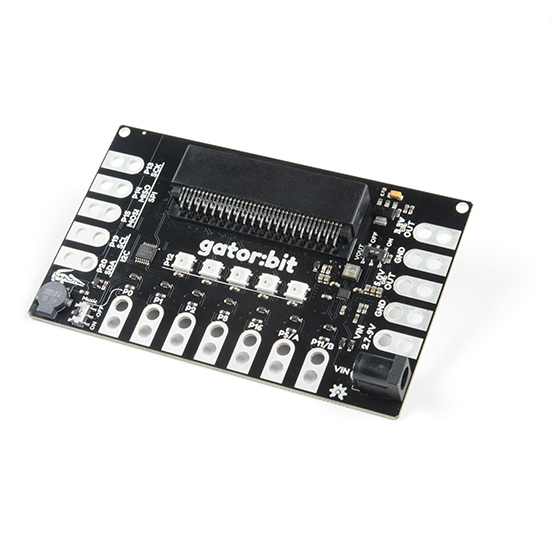 The SparkFun gator:bit v2.0 is an all-in-one â€œcarrierâ€ board for your micro:bit that provides you with a fully functional development and prototyping platform. Almost every pin on the micro:bit is broken out to pads that alligator (or crocodile, if you prefer) clips connect to so you can get the most out of it! Whether it is data visualization using the five on-board addressable LEDs or creating musical works of art using the built-in speaker, weâ€™ve got it covered with the with the SparkFun gator:bit! Each SparkFun gator:bit can be powered from 2.7V - 9V giving you quite a range of powering options. There are three ways of powering your gator:bit, from the barrel jack, through the alligator clip pads labeled â€œVIN,â€ or through the micro:bit. Any voltage input between 2.7V and 9V will be regulated to 3.3V to power the micro:bit, the speaker, and for use by any of the alligator clip pins.